Photo of the day: Snowman Poop! In honor of Wednesday’s near-blizzard in NYC, I wanted to share this winter treat with all of you. A few months ago I was visiting my friend in Mystic, CT, and we went to B.F. Clyde’s Cider Mill where they were selling this in the gift shop. 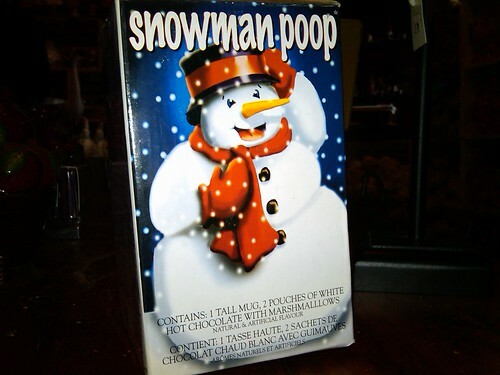 I was disappointed to learn that snowman poop is also known as mini marshmallows. This stocking stuffer by Gourmet du Village of Morin Heights, Quebec, includes: 1 tall mug and 2 pouches of white hot chocolate mix with marshmallows. …which I’m fairly certain you can make yourself at home. Stay warm this weekend, and Happy Friday!